We've been having some trouble keeping the fat squirrels out of our bird feeders. 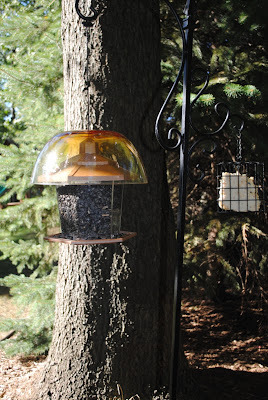 For a while, we didn't have a feeder at all because the crafty squirrels chewed up our last remaining feeder. All it took was a quick leap from the tree and some chewing around the bottom. 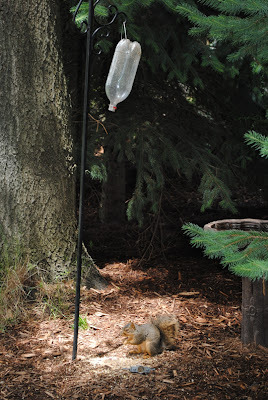 Notice the steel bottom sitting next to the feasting squirrel. My husband had been looking at the squirrel-proof feeders and not only noted at how expensive they were, but also the design. He began to wonder if we could modify a regular bird feeder. Not long after we were shopping at Walmart and came across this bowl in the clearance section. For only a $1, it was worth a try. We picked up one (several actually...I needed new popcorn bowls! ), along with a cheap feeder. 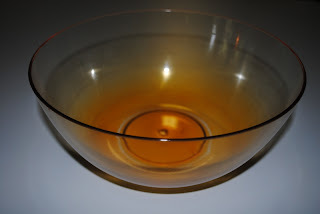 My husband simply drilled a hole in the bottom of the bowl and turned it over the top of the feeder. Presto...an inexpensive squirrel-proof bird feeder! The bowl is slightly wider than the base of the feeder and there is no edge for leaping squirrels to grab. Still we weren't positive it would keep the trickster away. A few days after hanging our new feeder, I heard a commotion outside. On a nearby tree was squirrel doing a chirping equivalent of cussing, looking in the direction of the feeder. He certainly was telling it a thing or two. Success! PhysicsQuest 2010 registration has begun! PhysicsQuest 2010, free to teachers of students in 6th - 9th grade, including homeschoolers, is now open for registration! To read a bit about this year's challenge, as well as past challenges, visit the PhysicsCentral website. The kit contains all the equipment you need for your class or group to preform 4 fun physics experiments focusing on for and motion. Use yo-yos, tart pans, play-dough and much more to explore how things fall, spin, swing and fly. The kit comes with a manual that explains the experiments as well as the physics involved. All of it is wrapped up in the third installment of the popular Spectra comic book series. The kits are usually sent out mid-January. Sound like fun? Then go to the registration page to sign up! "Sometimes I need to take a break, just like everyone else, but I happen to enjoy being around my kids and wouldn't have it any other way!" How do you find free time? Is it okay to take time for yourself? If so, how? Is it okay to take free time for yourself. Absolutely! There is no question about it. Getting some "me time" on occasion definitely improves my outlook on the day. Also, our kids need us to take free time. It is difficult to parent if you are constantly drained and don't recharge. Sometimes we moms forget to make time for ourselves, but it is so important. The more difficult part to this question is how? When my kids were younger, a friend and I used to swap kids once a month for three hours. This seemed to be the right amount for us to feel like we had a break without interrupting our daily schedules. The kids enjoyed it too, since they 'd have playmates for a few hours. As a result, the mom doing the child care sometimes had a bit of a break too, simply because the kids were occupied playing. 2. If you have older kids, assign some work and step out for a bit. Now that my kids are older, I can leave them home alone. I'll often give them independent assignments and then go run errands. Even though this isn't complete "me time", it does give me a bit of a break. No errands to run or you need a bit more relaxation? Perhaps there is a coffee shop nearby that you where you could just put your feet up for 30 minutes or so? My husband and I do a version of this on Saturday mornings. Our schedule and finances don't allow us many "date nights", but we usually head out every Saturday morning without the kids and grab a Starbuck tea. We'll either sit at the outside tables and enjoy the activity of our downtown area or run various errands. It doesn't much matter which, it is really just a break from the household. 3. Plan family activities that both kids and adults enjoy. Several years ago we started what our family calls "Football Ministry". Essentially, it is a time of fellowship with other families, usually coinciding with Sunday afternoon football games, that the whole family enjoys. Each family brings a dish to pass and stays for several hours, often times well after the end of the game. The kids usually go off and hang out, the men (and some women) go watch the same, and the rest mingle around the food table and converse. It is a way for everyone to get a bit of "me time" at the same time. 4. You must have a Moms' Night Out on occasion! Our support group tries to schedule at least several Moms' Night Out events each year. Really, several isn't enough, if you ask me. Usually someone offers to host in her home and those attending bring a snack or dish to pass. You could meet up at a coffeehouse, a restaurant for dessert, take a class together...anything. The important part is to get something down on the calendar! It doesn't have to be anything huge. Coordinate your schedule with a friend's and head on out! Often there is no agenda other than to talk with other homeschooling moms. I often feel most recharged when talking to other homeschooling parents as they understand my perspective, whether we are discussing homeschooling issues or otherwise. There are other ways to find time for yourself, such as hiring a mother's helper or enlisting the help of relatives on occasion. What I think is the biggest challenge for homeschooling moms is to just do it. We need to take the time for ourselves, even if it is just a walk around the block if that is all that can be managed. I don't believe the "hows" are the biggest obstacle, but rather understanding the importance and making the time. So, grab your calendar right now and plan some "me time". You'll be glad you did (and your kids will be too!). This is a repost from last year. I pray for those who lost loved ones on this day 9 years ago. Today is the 8th anniversary of a very sad day. There are not many days that I can recall exactly what I was doing at the time. This is one of them. It still plays like a movie in my head. My husband had convinced me to take a day trip to Chicago with him. He had a business convention to attend. I was resistant. I had never left my two little ones, ages 2 and 4 at the time. Sure, they had been left with babysitters for a short time on occasion. However, the thought of going out-of-state without them was unsettling. My husband thought I was being silly and it gave him more reason that I should get away. He went through a variety of scenarios to convince me. "Really, Heidi. What could possibly happen? It is still driving distance...if there is an issue with our flight I can just rent a car and drive us home." Still I was resistant. "What do you think will happen? Terrorists on the plane?" Yes. He really said this. I reluctantly agreed to go. I knew not going was going to be an issue between us. I couldn't put my finger on why I was so uneasy. On the take-off, I cried. I couldn't explain it. Something just didn't feel right. My husband thought I was nuts, an overworked mom who has been around her kids too much. His perception changed once we landed and arrived at the convention center in downtown Chicago shortly after landing. We arrived just in time to see a crowd around a TV in the lobby area and watched the second plane hit. I can only imagine the look I flashed my husband. At that point, no one knew all the details, just that the World Trade Center had been hit. My husband pulled me away and tried to get my mind off of it. It didn't take long for him to get concerned too. As soon we heard the Pentagon was hit, he agreed to head back to the airport. By that time, we couldn't even get on the airport grounds. Everything was shut down. We had the taxi take us to a car rental place. There were no cars available. Anywhere. Hotels were completely booked. A state of panic was starting to loom over the city as we listened to travelers try to contact loved ones. We had not planned to stay in the city long and we were completely unprepared. Our cell phone wasn't fully charged and we had little cash. We ended up sitting in a hotel lobby glued to the television, trying to speculate if there was more to come. I was not at all comfortable being in a large city, with no resources on us, in a time of national emergency. We eventually made contact with someone that agreed to drive the 5 hours to come pick us up. The first thing I did when I got home was give my two little ones a big hug. It took me a long time before I was able to leave them again and it wasn't until last summer that we were ever separated by states. What a sad day for our country. I can only imagine the horrors of those in the immediate area and those that lost loved ones. Still, it is a day vivid in my memory. Later my husband understood better why I was resistant and the power of a sixth sense in moms. I had no logical explanation for how I knew something wasn't right. I also had a sense that no one in my family would be harmed. It was warning and reassurance all at once. That day taught me to trust my intuition. It taught my husband to trust my intuition. More importantly, I learned that my faith will get me through times of uncertainty. And there is no question that there are uncertain times ahead. Praise God for the certainty of Salvation! Math Tutor DVD has become a familiar product since my first exposure to it two years ago. Since then, I have recommended it to both homeschoolers and traditional schoolers wanting to provide extra math instruction to their students. I've previously reviewed the Basic Math Word Problems, Algebra 2, and Young Minds Numbers and Counting titles. You can read complete reviews on these products here and here. I've also purchased additional titles to add to our homeschooling math resources. This time, I happily received two more titles to add to our collection: Pre-Algebra Tutor Volume 1 and The Texas Instruments TI-83 / TI-84 Calculator Tutor. Before I go into the specifics of these titles, let me first give a brief overview of Math Tutor DVD. More background information is also included in my previous two reviews. Math Tutor DVD is a provider of DVD and online math tutorials. The levels covered are primarily Algebra through Calculus (and beyond! ), but even some preschool and elementary level titles are available. The instructor, Jason Gibson, who has a BS and two Masters in Engineering and Physics, previously worked at NASA before focusing on his DVD offerings. While his credentials are certainly impressive (we are talking a rocket scientist, folks! ), Gibson is quite humble and believes that you don't need to be a genius to truly understand math and other subjects that tend to intimidate students, and perhaps parents too. Folks like Beethoven who could compose music while deaf, or Einstein who made incredible leaps of insight in physics - are the true geniuses. Everyone else, like you and me, just need to be introduced to the right instructor early on to break the process down and make the topics understandable. With understanding comes confidence, and confidence is 100% the name of the game in math and science. Gibson has a true knack for taking the complex and breaking it down into understandable steps. Not only is he a rocket scientist, he has true talent in teaching as well. Now, on to the products that I received. First up is The Pre-Algebra Tutor Volume 1. This 5-hour DVD teaches the fundamentals of Pre-Algebra. As I stated earlier, the explanations are very detailed and concise for all topics. Click below to view a sample lesson. 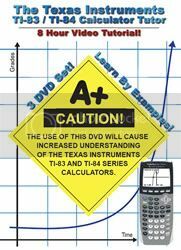 The Texas Instruments TI-83 / TI-84 Calculator Tutor is a new product for Math Tutor DVD.While our current algebra curriculum does not require use of this calculator, this is *the* graphing calculator to have and one that is in our near future of must-have tools. Gone are the days of simple calculators (Does anyone else remember when 4-function calculators hit the general public market at around $100?). Many schools are telling parents that they not only need to purchase this calculator for their students, but the student must be proficient at using it before the start of class. Rather than being stuck with a boring instructional manual, this 8-hour DVD covers all the major functions of the calculator in a step-by-step manor through working out problems. You can see a 18-minute sample video at the website here. I had both of my kids separately watch the portion of the Pre-Algebra DVD that covered exponents, which was very appropriate topic for both of them. My son, 6th grade, just learned about exponents this week with his normal math curriculum. While my daughter, 8th grade, had already covered exponents, she found herself in need of a review upon opening up her chemistry book this fall. "Exponents are now ingrained into my brain." Yes, it is quite thorough. No, there are no bells, whistles, or any other distractions that might take away from learning the material. Both of my kids felt like he couldn't have been more clear. Sure, it wasn't exactly entertaining, but anything that "ingrains" useful information into their brains is a winner with me. These DVDs are not meant to be stand-alone courses but as additional help in various topic areas. I have found them to be an excellent resource when my students aren't quite grasping a particular concept. I'm sure we'll get much more use out of them and continue to take fuzzy understanding to ingrained. Both the Pre-Algebra Tutor Volume 1 and The Texas Instruments TI-83 / TI-84 Calculator Tutor sell for $26.99 and can be purchased at Math Tutor DVD. All DVDs are guaranteed to raise grades, our your money back! Quite a guarantee! In addition to many DVD titles, Math Tutor DVD also offers an online membership giving access to all tutorials 24/7. How do you respond to family/friends that don't support your decision to homeschool? I've been very fortunate in this area in that I haven't really received a lot of negative comments from friends and family about our homeschooling. In fact, I thought my dad would be my biggest skeptic, yet when we made our announcement it didn't phase him one bit. However, I haven't completely escaped friends and family questioning me about our educational choices for our children. I had two in-laws in particular that questioned me heavily in the beginning. Our children were young and bright, however, and I think they felt that I couldn't mess up those early years anyhow. Then, after several years, they saw the results for themselves firsthand and really didn't have anything negative to comment upon. I think the best approach is to address any concerns, comments, or questions with confidence. I had done a ton of research on homeschooling before starting. The result was that any question brought forth to me already had a well-thought out, articulate response. I did not take offense to any question about our homeschooling and simply answered it. Not only did it show that I had already thought through the concern, but usually it exposed a fair amount of misconception that the inquirer had about homeschooling. Now that I have an almost high schooler, I 'm beginning to get a few more questions. I'm taking the same approach I did many years ago. If you simply don't engage the negativity and answer with confidence, what more is there really to say? I understand that some relatives may be more negative and persistent, but as with any decision for your family, you just need to draw the line in how you will engage in such conversations. If you find yourself addressing the same things over and over, it may be time to simply say, "Thanks for your concern," each time it is brought up and move on to a different subject. In my experience, answering with a confident smile and allowing the time to show the results has been all I needed to live peacefully among those that may not be entirely on board with my decision to homeschool.